​​If you enjoy our April Australian Education News please use the Forward button in the footer section to share it with colleagues and friends. It’s with this background, and in the current day, that the Prime Minister’s post May Day announcement came as such a surprise. In the northern hemisphere May Day is a traditional springtime celebration of fertility, frivolity and renewal – usually involving maypoles, village greens and Morris dancers and then the following day is a mundane trudge back to work. For autumnal Australia this was anything but a resumption of business as usual. In the middle of the afternoon we saw the Prime Minister, flanked by his education Minister on one side and David Gonski AC on the other, make the surprise announcement of a new national schools funding model and a second Gonski review to support it. The audacity of the move was both breathtaking and exhilarating all at the same time. This has followed more than a year of feverish speculation and politicking on what form the post 2018 education funding agreements will take following the Government’s rejection of the final years of the ‘Gonski deal’. The move away from years five and six of the deal has posted a new reality in education funding policy, leading to some apparently heated debates within the Council of Australian Government’s Education Council. With the next Education Council meeting set for this Thursday in Adelaide I’m sure the discussions will be equally forthright and heartfelt; although this time with a firm proposal on the table. The run up to last year’s budget saw the Prime Minister’s suggestion to separate the funding responsibilities of public and private schools between states and territories (S&Ts) and the Federal Government. ACSSO’s response to this was loud and clear that a shared responsibility for a matter of such national importance is essential. The suggestion then quickly melted back into the vat of political rhetoric. It did allow us to re-emphasise the call for Fair, Simple, and Transparent, and truly needs based funding for all schools – with no special deals, as a model that would apply across all sectors. The special deals that would see some overfunded schools taking over 150 years to fall back to their school resource standard funding had to end and funding had to be rebalanced and redistributed to schools in real need. This was the original intent of the Gonski review before the integrity of its needs based funding review was corrupted by the term that no school should lose a dollar - together with a range of legislated special deals in the move to secure the 2013 Education Act. It’s with this background, and in the current day, that the Prime Minister’s post May Day announcement came as such a surprise. That the Government is proposing a single national needs-based funding model to replace the current twenty-seven agreements that will cross all sectors, and the plethora of additional models and special deals within them is revolutionary and to be applauded. Now to the delivery of the new model. Like all policy declarations the temptation is to immediately dive into the detail rather than the intent behind the declared position. Perhaps it’s worth taking a moment to appreciate that education funding is a truly wicked problem where there can be no absolute right or wrong answers, just better or worse outcomes. The key to unlocking the implications of this is asking enough questions, and listening to the responses, in a way that may help to expose some of the layers of complexity and strip away the masks to fairness. As part of the new model’s legislative process a Senate Inquiry has been initiated that can tease apart some of the concerns and questions that are still to be addressed. A couple of queries that instantly spring to mind are; can the redistribution process to overfunded schools and sectors be accelerated, and are the four student and two school based loadings to the Schooling Resource Standard (SRS) base funding that address need appropriate for a national model - one that can see exceptional cases in many S&Ts. I understand that the Greens Party is taking a measured and pragmatic approach by awaiting the outcomes of the inquiry before reaching a final position on the new model and its implications. If we are looking at equitable outcomes in all of this just savour for the moment the concept of a single funding model that has the potential to be fair, simple and transparent with the tenet of creating – in the Prime Minister’s words - ‘great schools, great teachers, great outcomes’. In a world of political slogans that’s a great one to reflect on and to hold the politicians, of whichever flavour you might favour, entirely accountable for. I think we’d all struggle to find a parent that wouldn’t want this for their child and wider community. Stepping back to expand on what has led us to this point is the number of legislated adjustments and special deals that, over the years, have corrupted the integrity of needs based funding – and that’s just for the non-government sectors that operate less than 30% of Australia’s schools. One could say that the grand experiment to richly reward private sector schools with direct government funding, over the last twenty years or so, has been an abject failure in improving the educational outcomes of our national schooling system. What it has allowed is a massive expansion in the innate cost base of private sector schooling. A sector that has now come to want and expect additional government funding to subsidise the cost of maintaining and operating ever growing campus’s with facilities, and overt marketing campaigns, that public schools can only dream of. In a bullish economy with parents that can afford a growing fee demand for a private and exclusive education for their children then there are no worries. However, we are now in a more bearish economy where considerations of price and value are at the forefront of many family budget considerations. There is also the increasing appreciation of the qualities and inherent strengths of public education leading to burgeoning enrolments in public schools. With the resurgence of the fully inclusive public education system across Australia private sector schools are facing new challenges in maintaining their relevance and market share. Whilst we hear the statements that it’s about outcomes, and not the amount of money, this comes with the caveat that 25% of non-government schools are currently at 100% or above of their SRS and just over 1% of public schools are at this level for funding. There is an obvious need for change and for a renewed emphasis on the role of public education in our nation’s future. As part of the political process, and the heated debate on this topic, the Labor party, as the government’s opposition, has just announced an absolute commitment to providing an additional $22bn to schools if it wins power at the next election – ACSSO welcomes this and thanks the Labor party for the certainty on its position that has been subject to speculation in recent times, and it’s something we can all hold it accountable to if they form the next government. We will have to explore under which model this would be applicable too. If it’s under a new and truly needs based model without any special deals then there is the welcome potential to accelerate what is proposed. I would also like to pay tribute to a number of private sector schools and systems that have publically recognised their overfunding and welcome the chance to rebalance this to a fairer model. It is a deeply honourable approach which is to be applauded. The Quality Schools Initiative can allow a fresh start with the end in mind – a truly needs based funding model that can strip away the subjective and unfair nature of the current arrangements and special deals. The cornerstone of this is the Gonski 2.0 review that gives the potential to establish a body of evidence based best practice led by a trusted champion of needs based funding; a process that can give every school-age student the chance to thrive within their own communities and beyond. Our proud nation, its families and their children deserve nothing less. Now is the time for all our elected representatives to work collaboratively to make this a reality. We live in a nation that could well see three changes of government over the next ten years so please focus on the future in a way that can take the politics out of schools funding. After all, it’s the future where our children will be living and working. In an increasingly uncertain world they deserve all the help from us that we are able to give – and that they can give to us in return. Little J & Big Cuz, the first animated kids show to feature Indigenous Australians, has arrived along with free resources mapped to the Australian Curriculum to support Early Years (F-2) educators in including Aboriginal and Torres Strait Islander histories and cultures in their teaching and learning programs. The Little J & Big Cuz education resources’ F-2 framework concentrates on embedding Indigenous knowledge, understanding and skills within the teaching and learning content of each episode module, which is structured by a 5Es inquiry model and linked to learning in the Humanities, science, mathematics, arts, health and wellbeing, language and literacy. 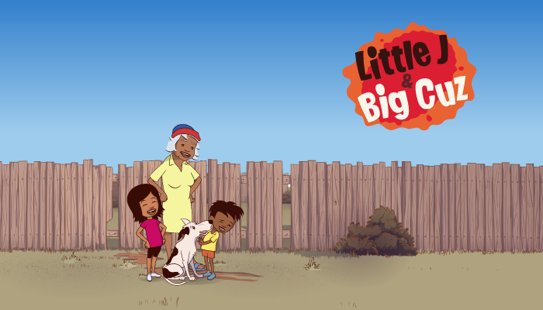 Little J & Big Cuz has been developed by the Australian Council for Educational Research (ACER), Ned Lander Media, NITV, Screen Australia, Film Victoria, Screen Tasmania and the Australian Children’s Television Foundation. The educational resources have been developed by ACER with support from the Secretariat of National Aboriginal and Islander Child Care (SNAICC) and Lotterywest. Visit www.littlejandbigcuz.com.au for more information. The University of South Australia (UniSA) will review and update the National Safe Schools Framework (NSSF) on behalf of the Australian Government Department of Education and Training. The NSSF provides all Australian schools with a vision and a set of guiding principles that assist school communities to develop positive and practical student safety and wellbeing policies. As part of this research project, UNISA is conducting a full review of the NSSF and asking participants to provide their recommendations for how the Framework might be updated to ensure that it will remain effective and relevant. The researchers want to reach all members of the school community, including parents and carers to participate in this work by completing an online survey. The survey, which takes around 20 - 40 minutes to complete, will be administered through an online, password protected platform, and asks questions about the NSSF and your opinions about what a safe, supportive and respectful school community should look like. 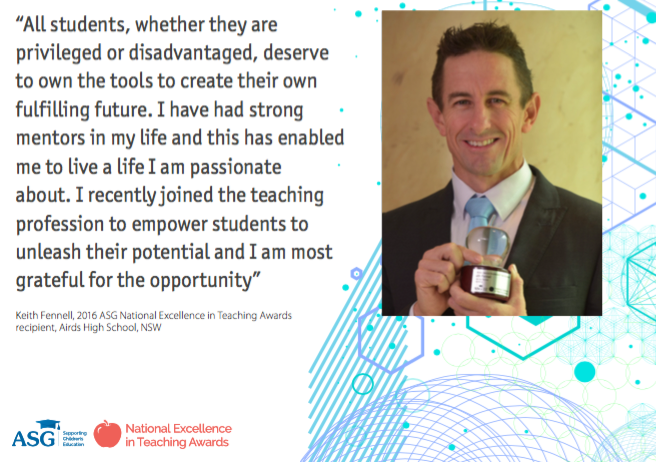 Principals and parent-teacher associations are being asked to identify inspirational teachers for this year's NEiTA awards. ASG NEiTA is an independent national awards program where early childhood and school communities (individual parents, school councils, committees of management, parent associations, secondary student councils, and community organisations) can publicly recognise and encourage inspirational teachers, directors, and principals who are committed to excellence in education. This is your opportunity to nominate outstanding teachers and leaders in your community who are making a real difference to children’s education. Senator the Hon Simon Birmingham, Minister for Education and Training will open the conference ahead of a strong program featuring Australian and international keynote speakers. Visit the Conference website to view the program.